In this post, we’re going to talk about the toughest option for reaching the Teide’s summit: the Mount Teide hike. This is an option we only recommend you pick if you’re fit and up for the challenge of walking; if not, there are other, simpler ways of getting up the mountain—we’ll get to that later. But first things first: you're here to find out about climbing Mount Teide by following the Montaña Blanca Teide trail and spending the night at the refuge, and we’re going to tell you everything you need to know. Let’s get started! Montaña Blanca, the beginning of the route, at 2,348 metres. The Altavista Refuge where you can spend the night at 3,260 metres. Right, now you know where everything is, let’s take a look at the route. This is the route people have always used to climb the Teide on foot and is made up of three stages. The first stage runs between Montaña Blanca and the Altavista Refuge. The second goes from there to La Rambleta along trail number 11 via La Fortaleza, and the third leads to the peak along trail number 10, Telesforo Bravo. There’s an alternative that we’ll tell you about later on if you want to spend the night at the refuge that doesn’t involve climbing Mount Teide in its entirety. This is the trickiest part. 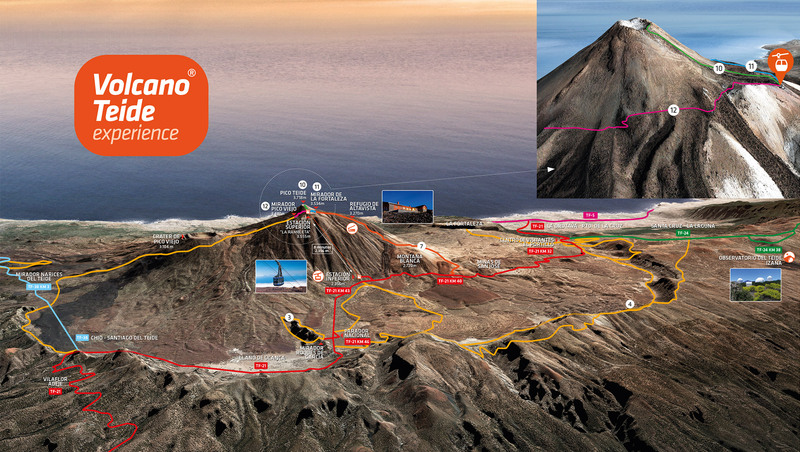 You follow trail number 7, the Montaña Blanca Teide trail, which begins on the TF-21 Teide road, at kilometre 40.7. 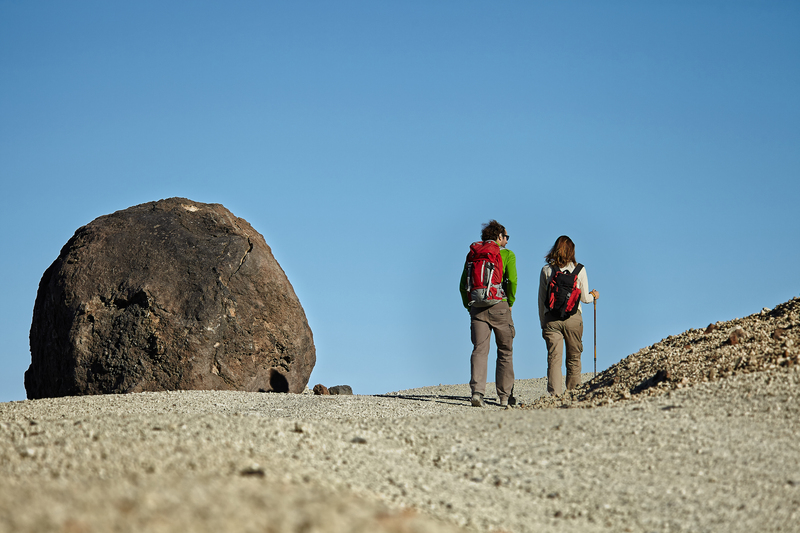 You can access the beginning of the Montaña Blanca Teide trail in your own car or by bus. There’s free parking in the area, but it’s not very big and isn’t monitored. 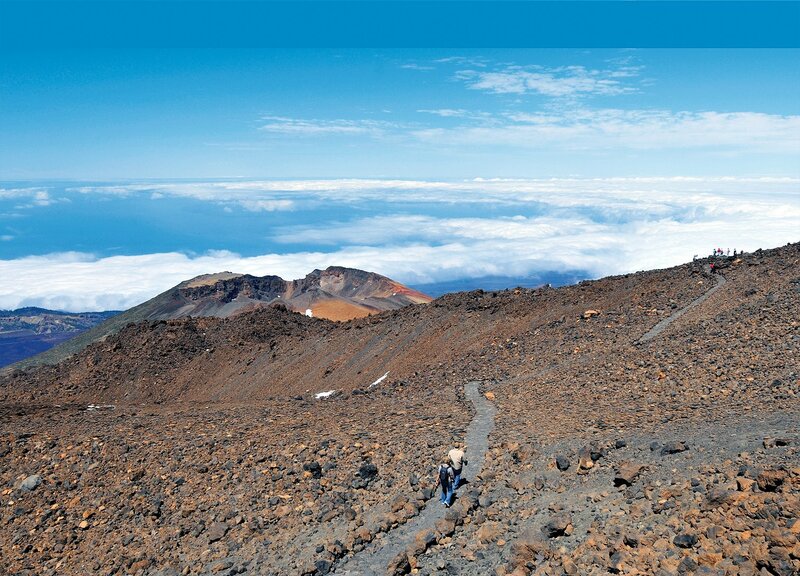 With every step you take, the Montaña Blanca Teide trail will wow you with its natural beauty. It’s one of the Teide’s most special trails, which is saying something, seeing as the park covers more than 19,000 hectares. You’ll start the Mount Teide hike by walking through landscape typical of explosive volcanic activity, with the ground covered in pumice. This is an area of outstanding scenic, volcanic (don’t miss the Huevos del Teide) and ecological interest. When you reach the peak of the Montaña Blanca, you’ll have walked about 4.53 km with an altitude change of 372 metres. But that’s nothing. We say that’s nothing because it’s from here on out that the Montaña Blanca Teide trail gets interesting. 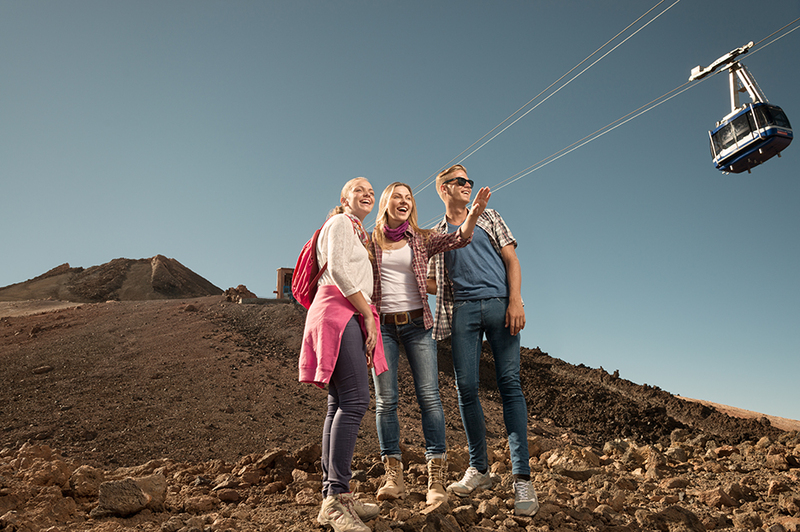 Yes, this is the trickiest part for hikers who are set on climbing Mount Teide: here you’ll start on a 2.56 km section walking over black lava, during which you’ll climb a massive 544 metres! The gradient is greater than 60% in places, so make sure you’ve come prepared. But it’s not all bad! As you’re hiking up Mount Teide, you’ll see how the volcanic flora changes and starts to thin out significantly. 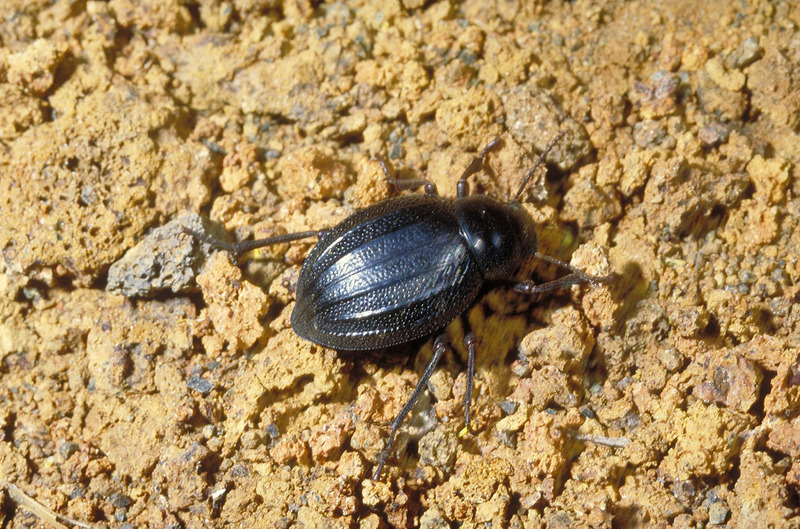 It’s an incredible natural spectacle, topped off by the animals you’ll spot that can only be found on the island, like the Gallot’s lizard or the pimelia ascendens, a flightless beetle that only lives in the Teide National Park. At about the halfway point of this steep track, you’ll come across some gigantic rocks known as the Estancia de Los Ingleses. Thanks to their formation, the bravest explorers used to spend the night huddled between them, lighting a fire and sheltering from the cold before starting their ascent to the peak the next morning. These days, they’re only used for a spot for a rest after the long hike up, as if you keep going for a few more minutes you will, finally, reach the Altavista Refuge, which marks the end of this stage of the route for climbing Mount Teide. The refuge was built in the mid-19th century and was originally only used as support for the National Park’s research projects. Today, after its latest refurbishment in 2007, this is where you can spend the night when you climb Teide on foot to recharge your batteries. 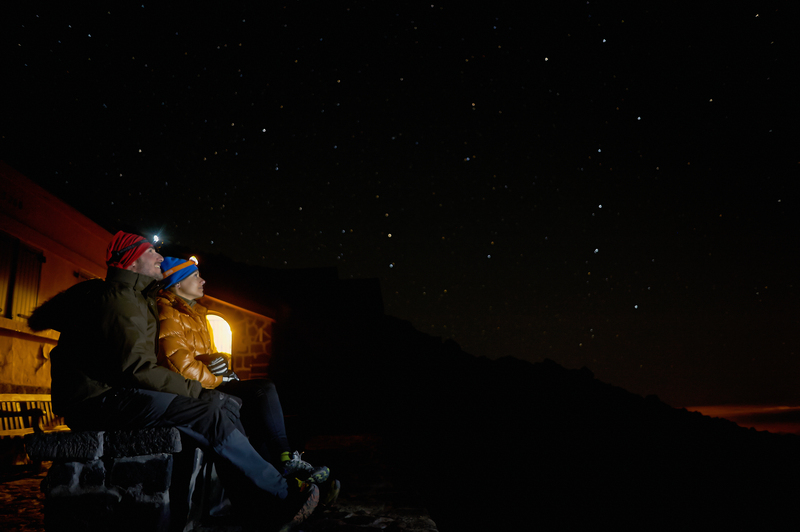 Rest up in Spain’s highest accommodation and sleep amongst the stars, under one of the starriest night skies in the world. Its elevation is 3,260 metres. You can arrive between 5pm and 10pm, but the rooms don’t open till 7pm. We recommend you arrive in time to catch the sunset. You need to be out of your room before 7.30am and out of the communal areas before 8am, when the refuge closes. It has everything you need to recover after the Mount Teide hike: three dorms, 54 beds with duvets and blankets, a kitchen, a living room, an infirmary, a dining room, heating, bathroom (no shower) and internet. You can buy water, snacks, hot drinks and soft drinks. There is no kitchen service, so you should take the food you want with you and cook it up there. There’s also a microwave for heating up food. You can only spend one night there. You can leave your belongings behind and pick them up on your way down. If you decide to take the cable car down (we’ll discuss this alternative in a minute), you’ll need to take your things with you on the way up. And the best part is that spending the night at the Refuge is the only way of seeing the sunrise from the Teide’s summit, but we’ll get to that in a minute. Seeing the sunrise from the highest point in Spain should be your priority, which is why we recommend you leave the Refuge before 6am. Seeing the dawn break is more than worth the early morning. And remember to wear a headlamp so you can see where you're going. You’ll be glad of it! The gradient of this second stage of the Mount Teide hike isn’t as steep, but the atmospheric conditions mean it isn’t exactly a walk in the park. It takes you through the Teide’s malpaís landscape, where there’s no vegetation, and then you’ll pass the La Fortaleza viewpoint before reaching La Rambleta after just under an hour. This is the best part. From La Rambleta you’ll have to take trail number 10, Telesforo Bravo, for which you’d normally need a free permit issued by the National Park. These are in high demand, and there isn’t much availability. So, normally, at this stage, you’d need to have planned ahead and already got a permit. By the way, if you’re interested, in this post we talk about how to get a permit for Teide’s summit. But don’t worry, you won’t need one. This post is all about climbing Teide without a permit. If you’ve slept in the refuge after climbing Mount Teide via the Montaña Blanca Tenerife trail and completed trail number 10 before 9am, you don’t have to worry about the permit, because at that time of day there’s free access to the trail. And there’s more! The cherry on the cake is at the end of the road, after you’ve walked the spectacular Telesforo Bravo trail, which peters out at the highest point in the country: Teide’s summit. From there, you’ll see one of the best sunrises in the world. You’ll witness the hypnotic combination of a riot of colours and the projection of the perfect pyramid of the Teide’s shadow onto the Atlantic Ocean, with the backdrop of neighbouring islands and the scent of sulphur in the air that reminds you you’re standing on an active volcano. Don’t forget: the Teide might be sleeping, but it’s still breathing. Leave the Telesforo Bravo trail before 9am and head towards the refuge, taking trail number 11 and then number 7 to the Altavista. You should bear in mind that the refuge is closed until 11am, so if you leave your things there you won’t be able to go back to pick them up until then. We don’t take responsibility for any personal items that you leave behind when you’re on your walk. Once you’ve got your things, you’ve got another four hours walk downhill along the Montaña Blanca Teide trail ahead of you. When you reach the starting point, at the base of the Montaña Blanca, you’ll have completed the toughest challenge that the Teide National Park has to offer. 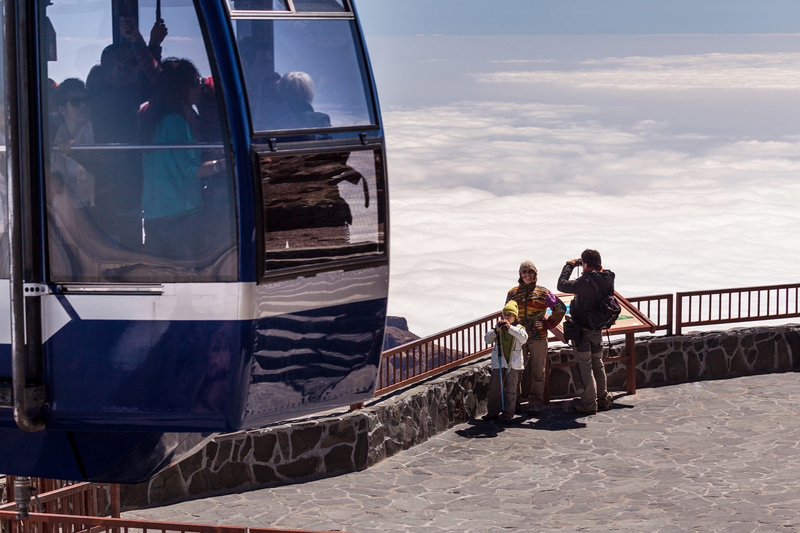 For lots of adventurers, taking the cable car on the way down is a godsend after all those hours spent climbing Mount Teide. If you think that might be the case with you, you’ve got two options: reserve a night in the refuge and the ticket for the cable car down the mountain as a combo, or buy the cable car ticket yourself. In either case, you’ll need to take your belongings with you (that is, you can’t leave them at the refuge), and when you get down to the base station, you’ll have to make your way back to the beginning of the Montaña Blanca Teide trail, which is 3 km away. 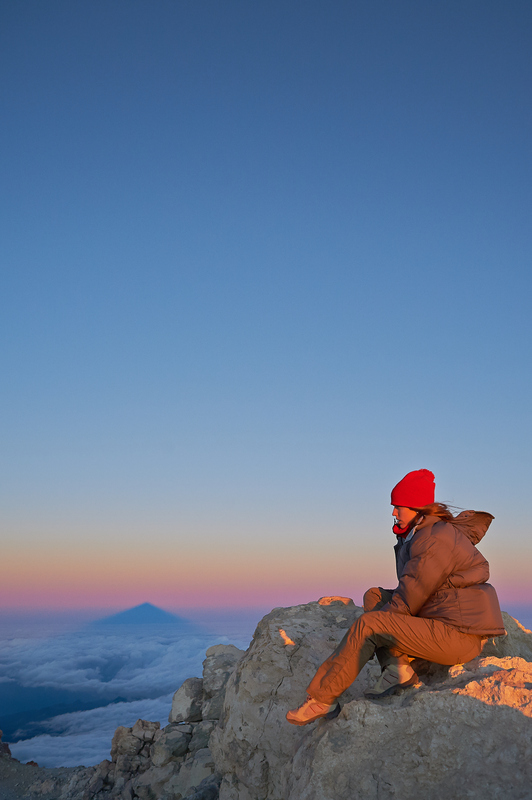 Seeing the sunrise from the Teide isn’t something only people who are ultra-fit can enjoy. As to see the sunrise from the top you have no choice but to spend the night at the refuge, the other way to reach it is to take the cable car from the base station to La Rambleta and then walk down on foot for about an hour. In this case, the Teide trails you should take are the number 11 and then the number 7, which will take you directly to Altavista. If you want to see a map of all the Teide’s trails, click here. If you don’t want to take the tough option of climbing Mount Teide via the Montaña Blanca Teide trail or you’re going to be accompanied by someone who isn’t as physically capable, the cable car is your best option. That’s why we’ve put together this other post, in which we talk in detail about your options to reach the peak with the help of the cable car. When the La Fortaleza Viewpoint trail is closed due to weather conditions and you’ve reserved the combo of the night in the refuge + the cable car, if you cancel the night at the refuge, you’ll get a full refund. If it’s the cable car that’s closed, then if you cancel, you’ll receive the amount corresponding to the descent by cable car, so you’ll have to go down on foot the same way you came up. 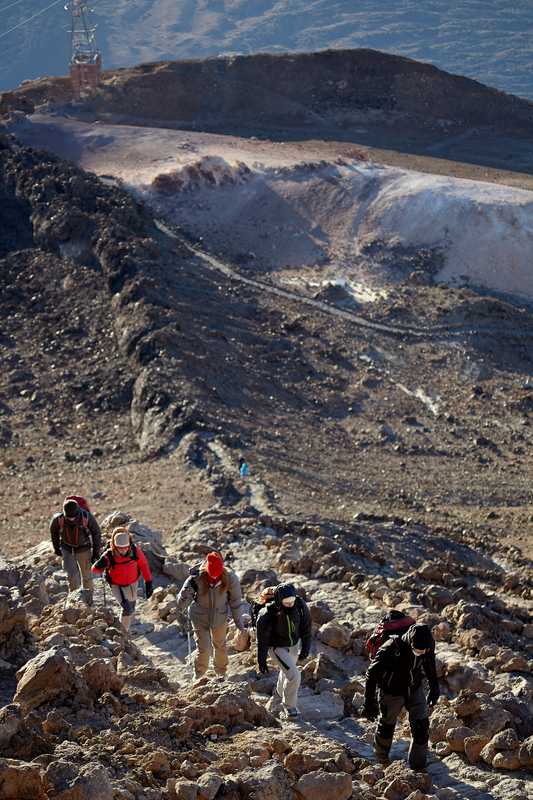 Climbing Mount Teide isn’t your only option. Far from it. There are all kinds of ways of reaching Teide’s summit, but if we get into that then things like permits and alternatives for the main crater come into play... we’ve explained it all in this guide to the Teide. 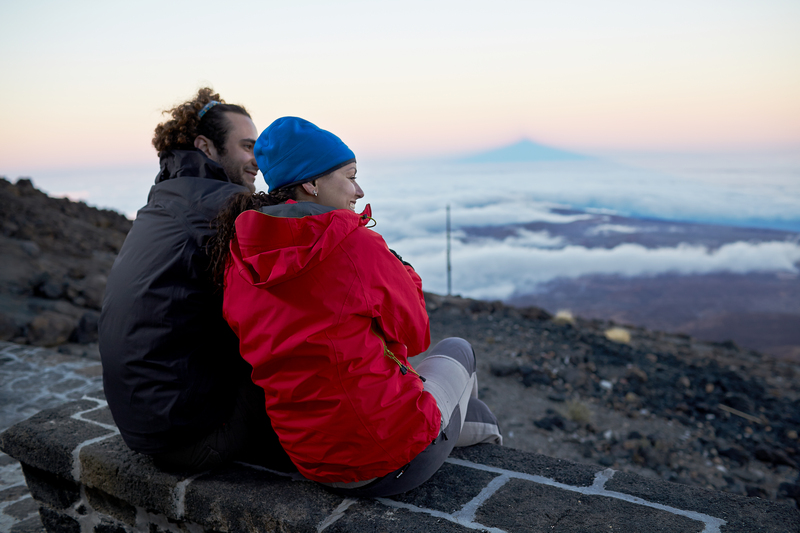 And if you want to explore the volcano under your own steam, don’t miss this: we’ve prepared a calendar on which you can easily see all of the activities that are available in the Teide National Park. Get organizing! 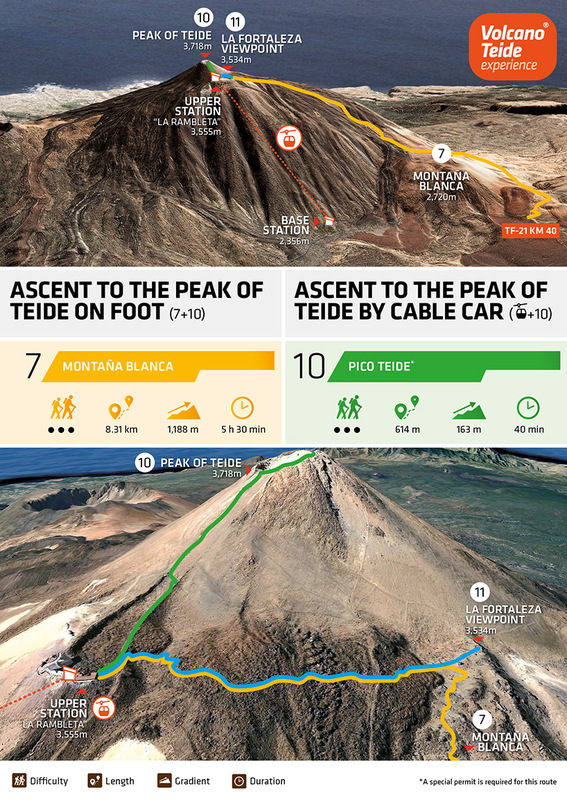 After all that, it’s time to say goodbye, but we’ll leave you with this infographic that compares climbing Mount Teide on foot to doing it with the help of the cable car, just in case after reading this you still haven’t quite made up your mind. Enjoy!